The Banach–Tarski paradox is a mathematical theorem in set-theory. This theorem states “Given a solid ball in 3‑dimensional space, there exists a decomposition of the ball into a finite number of disjoint subsets, which can then be put back together in a different way to yield two identical copies of the original ball.” The idea is if one is able to divide a ball into an infinite number of pieces, it is possible to disassemble and then reassemble the pieces (moving the pieces around without changing the shape) to form two identical balls. The pieces themselves are not “solids” in a sense, but infinite scatterings of pieces. The published paper may be found with this reference (Banach, Stefan; Tarski, Alfred (1924). “Sur la décomposition des ensembles de points en parties respectivement congruentes” Fundamenta Mathematicae 6: 244–277). The reason the Banach-Tarski theorem is called a paradox is that it contradicts the basic intuition of geometry. For example, dividing the ball into parts, moving them around by rotations and translations without changing the pieces (stretching, bending, or adding new points) to form two new balls seems to be impossible, since all of these operations by intuition don’t seem to preserve the volume. The mathematical proof of this theorem depends upon the set of axioms (assumptions) going into the set theory. It can be proven using the axiom of choice, but allows for the construction of non-measurable sets which requires an infinite number of points, an uncountable number of choices. The more formal simplified definition of the Banach–Tarski paradox, it is possible to obtain k copies of a ball in the Euclidean n-space from one, for any integers n ≥ 3 and k ≥ 1, i.e. a ball can be cut into k pieces so that each of them is equidecomposable to a ball of the same size as the original. So what are the spiritual implications that we can draw from this mathematical theorem? When we consider something that resembles the original but is actually a copy, it looks like the original. What does this sound like? Something that appears right to man but the end thereof leads to death? (Mishley / Proverbs 14:12) Deception? The influence of deception in our lives encompasses a variety of methodologies. I discussed a few of these methodologies in the article https://www.matsati.com/index.php/what-are-the-consequences-of-not-having-a-biblical-world-view/ Most of us go through life not recognizing that our personal worldviews have been deeply affected through media and other influences. The secularized worldview of history, law, politics, science, God and man affect our thinking more than we realize. This is what the Apostle Paul meant when he said that the Colossians have been “taken captive through philosophy and empty deception, according to the tradition of men, according to the elementary principles of the world, rather than according to Christ.” (Colossians 2:8) This example among hundreds or thousands of others illustrates how history is marked by those who, in different ways, have influenced people away from God and damaged, even destroyed, their lives. This is why we are called to diligently study God’s Word to apply and trust in God’s truth in every area of our lives. This reveals to us the power of spiritual deception and why the Tanach and the Apostolic Writings repeated warn us about those who seek to deceive us spiritually. This teaches us about the power of God’s Word and the significance of our words. Here the author of Hebrews speaks of God’s word being capable of discerning the intentions of the heart. Our words have the capability of destroying, deceiving, or telling the truth (proclaiming the Word of God). 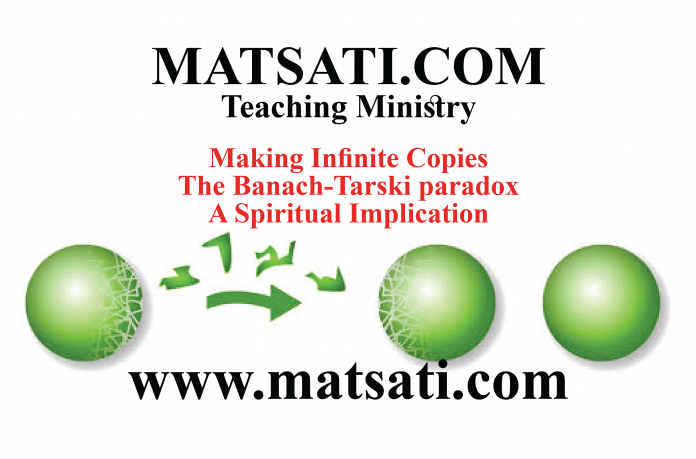 The spirit of the antichrist described by the Apostle John parallels this mathematical theorem (Banach–Tarski paradox) where the deception functions as a copy of the truth, where untruths are incorporated into the copy. This provides us with a semblance of the original, but only looks like the original because it is a deception. The prophet Isaiah and Jeremiah teach us if one allows the hidden lusts and desire to control us leading the flesh and the soul (נפש Nefesh: mind, will, and emotions), doing so may lead a person to believe God’s Spirit is leading them when it is not. This same deceiving power is present in false doctrines (false theologies), cults of every kind, Satanism, New-Age, Eastern Religions, etc. In the end, it is our decision to seek the Lord God of Israel and to study His Torah (all of God’s Word) which not just leads us to righteous and holy actions but also reveals what we truly believe, and where our faith and allegiances lay. (What the author of Hebrews 4:12-13 is trying to say.) These things begin by believing that God exists and believing in His Messiah Yeshua, that he died for our sins. The Lord then comes to dwell in our hearts as we invite Him into our lives, and as we open the Scriptures and begin reading and studying His Word, the Lord helps us, empowers us to overcome sin and to live for Him. By His Spirit we also know the truth and are resistant to deception. We are empowered to be able to recognize a false copy, and discern the original so as not to be deceived! This is the power of God in our lives!